SIERRA Leone youngster Kingsley Koroma has a smile to light up any classroom. 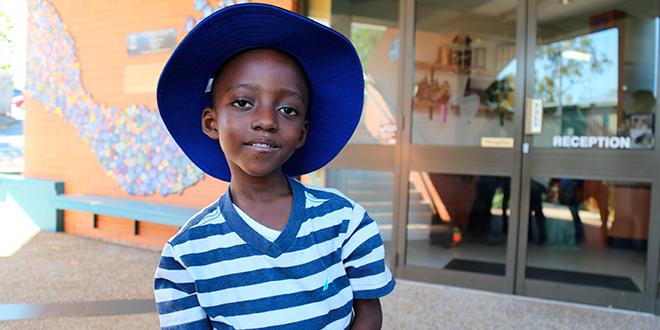 The five-year-old started prep at Our Lady of the Rosary primary school, Kenmore last week, after local parishioners dug deep to donate tens of thousands of dollars needed to cover his school fees. “I am so happy about it,” Kingsley’s mother, Manjia, who was overwhelmed with the generosity of local parishioners, said. 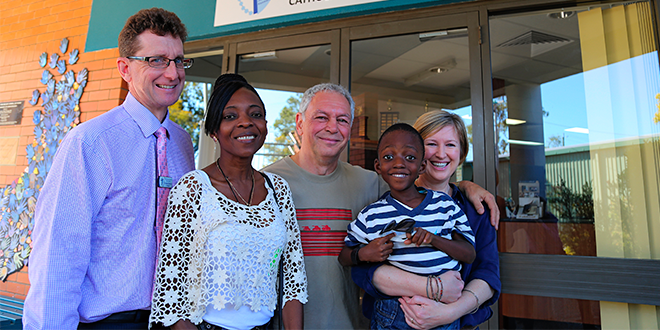 Newly-arrived mother and son were sponsored to come to Brisbane where Ms Koroma will spend the next four years studying to improve her nursing qualifications. “Studying in the outside world is a vast difference to Sierra Leone, where the educational system is so poor,” Ms Koroma said. “When I return there, I will be able to save more lives. The Koromas’ host family in Brisbane, Jane Shakespeare and husband Jeremy Davies, were taken by surprise when they learnt they would have to pay full international student fees for Manjia’s studies, and that Kingsley’s primary education would also have to be paid at the full international rate of $15,000 per year. When Our Lady of the Rosary principal Andrew Oberthur heard of Kingsley’s massive education bill, he put out a call for help via the school’s newsletter and social media. “I was overwhelmed at the response,” Mr Oberthur said. “Within a few days we had raised $25,000. As well as Our Lady of the Rosary parishioners coming to Kingsley’s aid, the parish conference of the St Vincent’s de Paul Society quickly agreed to cover the cost of the youngster’s books and uniforms. Ms Shakespeare said her connection with Sierra Leone stretched back 11 years when she made a “life-changing” visit to the country researching how women’s groups could start micro-businesses. “Manjia’s mum was my mentor at that time,” she said. Since then Ms Shakespeare has become committed to helping orphaned children in Sierra Leone and she has set up The Fig Tree Children, a grassroots charity to empower children and communities to overcome extreme poverty and reach their potential. The charity links sponsors with 54 orphans inside the west African nation to pay for their schooling and for carers. Sierra Leone was gripped by a decade-long civil war, the “Blood Diamonds” war, and then was overwhelmed by the Ebola virus. Both these tragedies created waves of orphans, estimated to be more than 12,000. Sierra Leone is amongst the world’s poorest countries, with a young population – 42 per cent are under 14 years of age; 61 per cent are under 24 – so education is critical if the country is to rebuild. In her home of Bo, the country’s second-largest city, Ms Koroma is a member of the St Francis Xavier parish, and is a carer of village children in desperate need. They are now part of her extended family. Ms Koroma helps put them through school, and receives a small amount of government money to do that. While she is studying in Brisbane, she hopes to also work up to 20 hours a week to send money home to support her family. “It’s not an easy task, but with the Lord I hope to get through,” Ms Koroma said. During her Brisbane stay, she hopes to embrace parish life at Our Lady of the Rosary. She has already signed on to the parish rosters. “I just like giving out my gifts – proclaiming the Word of God,” she said. Enquiries about donating to help Kingsley and Manjia Koroma can be made to Mr Oberthur at Our Lady of the Rosary primary school’s website.